Text by Frits Gierstberg, Joris Luyendijk. 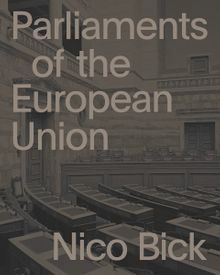 In Parliaments of the European Union Dutch photographer Nico Bick (b. 1964) presents a unique photographic view of the plenary chambers where the European democracy is actually realized. The book features photographs of the plenary chamber in the parliaments of the twenty-eight European Union member states and the two European Parliaments in Brussels and Strasbourg. Each plenary chamber is photographed from one viewpoint, from the floor itself, in three or four photographs and presented in a triptych or tetraptych fold out. As a series this project makes the European democratic landscape and its significance visible. Key element of the project is to allow the observer of the photo series a feeling of being ‘part of the room’. The result is a stunning monument for European democracy. In Parliaments of the European Union, Dutch photographer Nico Bick (born 1964) captures the plenary chamber in the parliaments of the 28 European Union member states. Featuring triptych foldouts with images from multiple viewpoints, the volume is a homage to European democracy. Hardcover, 11.75 x 14.75 in. / 242 pgs / 106 color.